Does talk solve anything? It’s often said that the belief that it does is the great liberal myth. But it’s a belief shared by the axial age religions, that great movement that mysteriously flowered between about 600 BCE and 700 CE, and birthed (among other things) Buddhism, bhakti Hinduism, Christianity, Judaism and Islam. What made this flowering so extraordinary, and seemingly different from what came before, was the new-found emphasis on compassion and empathy. The Laden Table is a piece that’s had a long development. Six women (Yvonne Perczuk, Nur Alam, Raya Gadir, Chris Hill, Marian Kernahan and Ruth Kliman) have been coming together for the last nine years to talk and share stories from their diverse backgrounds. The resultant play is built on a simple conceit: two families, one Islamic and one Jewish, each meets to celebrate a festival. These two families don’t interact with each other (well, they do, but that’s spoiler territory) – their separate evening meals are presented simultaneously on stage, and the impact is to suggest that the different families are really not so different after all. Both know love. Both know suffering. And both know how to argue among themselves. A large ornate table stands centre stage, and lit by Benjamin Brockman and designed by Courtney Westbrook, it’s a visual feast, and a powerful symbol of both the possibility of communion and the weight of tradition. Director Suzanne Millar has put together a strong ensemble, and she and her team work the space well, effectively juxtaposing the imposing presence of the table with the creation of vibrant, passionate, living characters. There are some standout performances, including Jessica Paterson as a young Australian Jewish doctor who’s witnessed the horrific consequences of political violence, and Sarah Meacham, who plays a young Australian Islamic woman navigating family expectations. And back to those arguing families: The play’s main aim is to take on prejudice, and one of its major sources, ignorance. After all, evil does evil, but not half as well as stupid. Where does bigoted thinking come from? We teach children it’s immoral, but that’s only the half of it. It’s also the result of intellectual error. All Jews are…. All Palestinians are…. These sorts of statements fail to convince, unless pain and grief skew our thinking, and simplicity appears as a solution, rather than what it is – a great denial of Life, in all its glorious complexity. Perhaps ironically, considering its origins, the play doesn’t present talk as leading to a resolution. The playwrights are sensibly modest in this regard. How could such huge problems be solved so quickly, so easily? But, of course, it’s the conversation with the audience that ultimately matters. The Laden Table is vital, exciting, invigorating theatre. One of the greatest gifts of Marxism is the concept of ideology. One of the greatest curses was the Chinese Cultural Revolution. 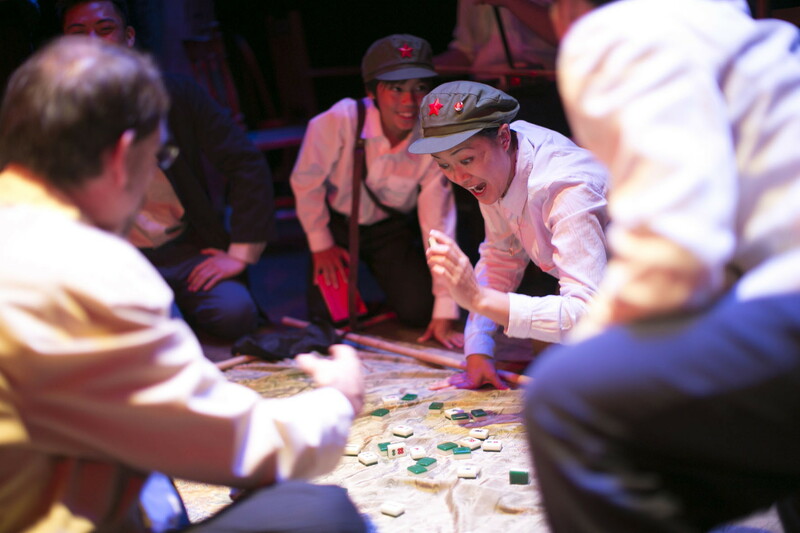 Firstly, the Cultural Revolution, where a half of Justin Fleming’s intelligent, thought-provoking play is set. In 1966, Mao decided to purge China of influences deemed capitalist, reactionary, un-Chinese. The result was a human tragedy of heartbreaking proportions. Millions were persecuted whose only crime was to offer the gift of diversity. Fleming’s play focuses on the trauma suffered by one of these families, targeted simply because of their love of Western music. Director Suzanne Millar and her entire ensemble do a fine job of evoking a society in crisis. The staging is simple, beautiful, and provides the perfect arena to present a truly awful spectacle; naïve exuberance overcome by dreadful paranoia. Renee Lim, as the music teacher determined to pass on her gift to her son, delivers a moving portrayal of steely resilience. The other half of the story is set in the 1980’s, in both China and Australia, and presents the long term consequences of the Revolution. Dannielle Jackson and Michael Gooley give intelligent, likeable performances as father and daughter, two Australians navigating their connections with people whose trauma is still raw. One of these lines is delivered by Gooley, as the crusty Australian diplomat. “We have to keep the door open,” he says. Discussions must continue. The second of the lines is foreshadowed by a cool, frightening party official, played admirably by John Goodway. Then Alice Keohavong, in a wonderfully amusing portrayal of a Chinese emissary in Canberra, snaps it out again. As they bargain the return to China of a talented pianist (played by Harry Tseng), trouble is encountered. Gooley suggests there are ‘contradictions’. “Contradictions? We like contradictions!” chirps Keohavong. The human spirit resists a tyrannous simplicity. And now, finally, back to where I started, one of Marxism’s gifts: ideology. But the rub is this: how much do we think culture matters? Mao launched a maniacal attack, and this sort of lunacy gives cultural introspection a bad name. It leads us to think it’s best to just let a thousand flowers bloom, without ever bothering to stop and smell them. Mao’s mistake was to think this should be done by state edict rather than discussion. It’s as though he assumed there were problems to be fixed, as against possibilities to be encouraged. And what does this engaging, exciting production by bAKEHOUSE offer the cultural discussion? *I’m ignoring the whole (obvious) issue of the commodification of art and the reduction of audience members to consumers as against co-producers. Billed as ‘a flight of fantasy’, this is a theatrical confection, a fascinating non-typical Australian play. It’s a conversation between Lyndon Johnson and Jackie Kennedy, set only hours after JFK’s assassination. Despite being peppered with historical allusion, Ron Elisha’s play is not an attempt to present a truthful account. But it’s certainly engaging, thought provoking theatre. Director Michael Dean elicits eminently watchable performances from both Ben Wood and Lizzie Schebesta. And Nick Plummer and Susan Millar have done a wonderful job of transforming the simple downstairs TAP white box theatre into the interior of AirForce One. With two famous people and their milieu presented the play becomes, if not hagiography, then certainly an exhibition of icons. Johnson and Kennedy as political royalty? This is a fascinating tension. America is a democracy, isn’t it? And aren’t we? The play is an exploration of the connection between the personal and the political. It can be tempting to believe that our politics (and our morality) are something we attempt to live up to, a guide for our behavior. But a piece that looks at the personal lives of the politically powerful can draw attention to the possibility that our politics are often simply self serving. And, of course, we’re all politically powerful. And it’s self serving to assume we are not.